Lorena Fontaine, LLB, LLM, PhD, a member of Sagkeeng First Nation in Manitoba, will take the role of Academic Lead, Indigenous Affairs — overseeing UWinnipeg’s Indigenous Course Requirement (ICR), the Weweni Indigenous Scholars Speaker Series and Indigenous Languages. 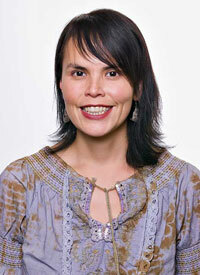 Fontaine is an award-winning researcher, author, and associate professor with deep expertise in Indigenous language rights and the legacy of the Residential schools. She has taught at First Nations University of Canada and the School of Public Policy at Queen’s University, and is currently teaching and researching at UWinnipeg.